Every day we subject our skin to environmental pollutants and harmful effects of the sun which clog our pores making skin appear dull and lifeless. In our mid-20s our skin begins to lose that firm, youthful glow as the production of collagen and elastin begins to slow. An article in the Boston Globe revealed that 75% of household dust is made up of dead skin cells. We shed nearly 8.8 pounds of dead skin cells each year. You may have progressed to the point of developing a good skin-care routine for your face, but don’t ignore the rest of the body. As we age, the skin’s natural exfoliation process begins to slow resulting in an accumulation of dry, dead skin cells. By exfoliating with a body scrub, dead skin cells are removed making way for smooth, supple, younger-looking skin. You can easily spend £80 for a body scrub spa experience or pay £12 for a jar of prepared body scrub, or you can make your own for pennies. You can enjoy an inexpensive spa treatment at home with these body scrubs. Preparation is quick and easy as the ingredients are normally found in your kitchen. These 3 body scrubs are designed for dry or sensitive, oily, and normal skin types. The gentle, natural oils in raw sugar are ideal for dry and sensitive skin types. Sugar scrubs are very effective ways to hydrate the body which may help to prevent skin conditions such as eczema and psoriasis. Sugar scrubs are also ideal for mature skin as it is packed with the goodness of alpha-hydroxy. Sugar scrubs are also gentle enough to use on the face. A sea salt scrub is considerably more “abrasive” than a sugar scrub and can be quite beneficial for rough and calloused skin. Sea salt has therapeutic benefits that help draw out toxins and impurities. Sea salt is ideal for acne-prone skin as it helps to absorb excess oils. Keep in mind that you will experience a slightly stinging sensation when using a sea salt scrub on open sores or cuts. The caffeine in a coffee scrub stimulates and invigorates regeneration of skin cells. Caffeine is also a vasoconstrictor, causing blood vessels to constrict which may temporarily reduce varicose veins and rosacea. When coffee is applied to the skin it helps to redistribute fat cells and decreases the formation of cellulite. 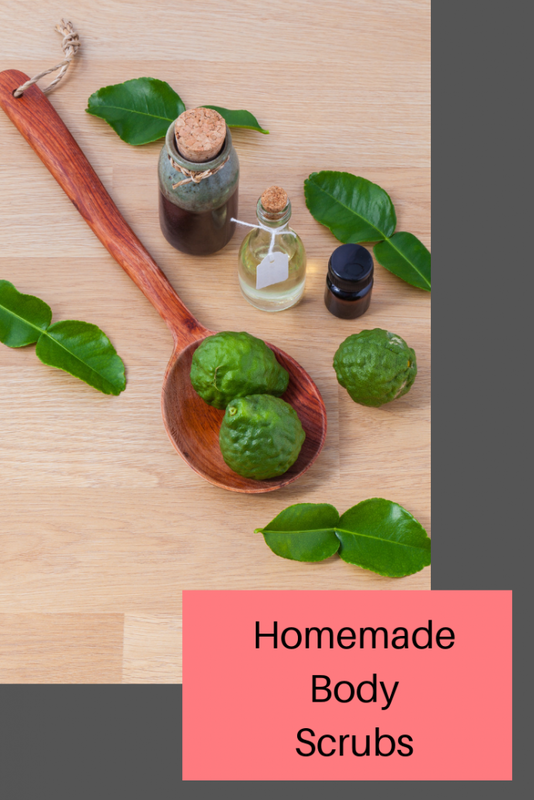 You can add your favorite essential oil to your homemade body scrubs. Citrus scents such as orange, lemon, grapefruit and lemongrass work really well with the sugar and salt scrubs, while vanilla, bergamot, ginger, patchouli and ylang ylang complements the coffee scrubs. You can also add a teaspoon of Vitamin E oil to your scrub, or introduce some other oils such as sesame, avocado, sweet almond oil, jojoba oil, fractionated coconut oil or even sunflower oil. Each will provide a unique texture and benefit to your skin type. Take a long, hot shower to open up your pores. Don’t use soap prior to a body scrub as the scrub will do a far better job at removing dirt and oils trapped in your pores as well as removing those dead skin cells. Turn off the shower and place a small amount in your cupped hand. Apply the body scrub all over your body. Don’t be alarmed if your skin starts to appear red. Using friction, you are bringing the blood to the surface of your skin, allowing the process of healing and regeneration to occur. It’s best to sit in an empty tub or shower and scrub away the layers of dirt; oils and dead skin cells as the oils in the body scrub will make your tub or shower slippery. I love that you’ve included different options for different skin types! That coffee scrub sounds amazing, I’ll definitely give it a try! I’ve been wondering whether I can re-use my ground coffee as a scrub – I’m definitely going to give that one a go! I definitely need to give making my own body scrubs a try! These all sound great, I especially like the sound of the sea salt scrub! When I use a scrub my skin always feel great so it is definitely something I need to do more often, especially with summer on its way! Oh I love the idea of making your own body scrubs! My girls would love to help too!